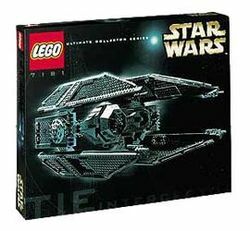 The set 7181 TIE Interceptor was a Star Wars Classic UCS set released in August of 2000. It included a model of the TIE Interceptor, a starfighter used by the Galactic Empire. This is a description taken from LEGO.com. Please do not modify it. Build and display this awesome TIE Interceptor! Facts about "7181 TIE Interceptor"
Build and display this awesome TIE Interceptor! This is not your little brother's model. The most advanced TIE fighter of the Imperial Navy becomes the centerpiece for any Star Wars collection. Its intimidating dagger-shaped solar panels are recreated with a precision that would please Darth Vader himself. More than 700 pieces make up this amazingly accurate model, which fits on a durable display stand. But display model with caution. This TIE fighter is so real looking, it's scary — especially for would-be Rebel pilots. Ages 14+. 703 pieces. This page was last edited on 17 August 2017, at 01:35.